“If once a man indulges himself in murder, very soon he comes to think little of robbing,” so said English essayist Thomas Penson De Quincey. This early 19th century writer and social commentator published extensively on some of the social problems of his countrymen. De Quincey is considered to have founded a genre of literature in western culture, that being addiction literature. His scribblings recorded the progression of unnatural cravings which lead to all sorts of misdeeds and destruction. Thankfully, 21st century north Florida does not have the problems of Great Brittan during its period of industrialization. However, there is seemingly one addiction which recurrently appears in the spring of each year resulting in a crime against horticultural senses. “Crepe Murder”, the excessive and radical pruning of crepe myrtles, is easy to see in home landscapes and managed public sites. The reasoning for this offence varies, but the results are always evidenced by a popular tree blooming in the wrong location. 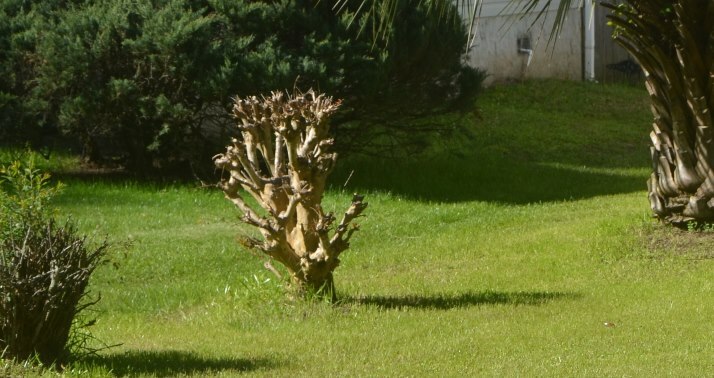 Improper pruning techniques, will damage the structure and health of crepe myrtles. Crepe myrtles grow best in full sun with rich, moist soil. However, they will tolerate less hospitable positions in the landscape just as well, once it becomes established. It grows well in limited soil spaces in urban areas such as along boulevards, in parking lots, and in small pavement cutouts if provided with some irrigation until well established. Available in all shades of white, pink, red, or lavender, the 6 to 12 inch long clustered blooms appear on the tips of branches during late spring and summer in north Florida. The individual flowers are ruffled and crinkly as to appear made of crepe paper. Most forms of the tree are upright, upright-spreading, or vase-shaped, spreading out as they ascend. Most tree types grow to 20 to 25 feet tall although there are dwarf cultivars from which to select. Properly placed, crape myrtles can be a low-maintenance addition needing little or no pruning. Problems with overgrown, misshapen, or misplaced crape myrtle can be greatly reduced with proper cultivars selection. This starts with proper plant selection at the nursery, and then proper placement in the landscape. Unfortunately, landscape professionals and homeowners often attempt to compensate with the consequences of poor cultivar selection and crepe myrtle placement. This is especially true when these trees were planted by others who gave no consideration to the significance of their poor choice. If pruning is unavoidable, recommended types of pruning include tipping and pollarding. Other pruning methods like topping are not usually recommended as the drastic removal of large-diameter wood will result of shortening all stems and branches. Tipping is similar to topping, except cuts are made through smaller-diameter branches on the outer edge of the plant canopy. Tipping is very time consuming, but creates an attractive tree. Pollarding involves initially making cuts through branches up to about three years old and then annually removing all or most sprouts at the original cut. Over time, wound-wood and dead branch stubs form a “pollard head,” where sprouts are removed each year. Pollarded trees are cut back to exactly the same size each year because cuts are made back to the pollard heads. The pollard head contains abundant stored energy with little decay and should not be removed. Once initiated, pollarding requires annual pruning to remove regrown sprouts. This increases the maintenance required on an otherwise low-maintenance plant. It is much simpler to make the correct cultivar choice and plant placement. This eliminates the addiction to crepe murder and the robbery of the homeowner’s time doing needless pruning. To learn more about proper pruning techniques for panhandle Florida, contact the local UF/IFAS County Extension Office. Click here for contact information.